In 1972, a college theater student Richard Collier (Christopher Reeve) is celebrating his debut as a play writer. 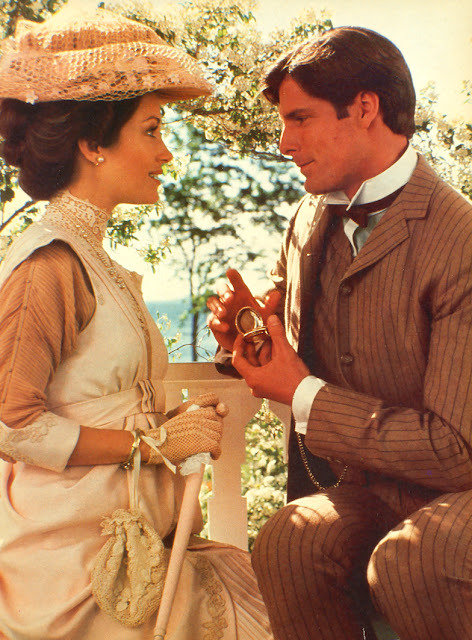 During the celebration, he is approached by an old woman (Susan French) who places a pocket watch in his hand and pleads "come back to me"… This is the very strange beginning of one the audacious movie I have ever seen : “Somewhere in Time” (1980). 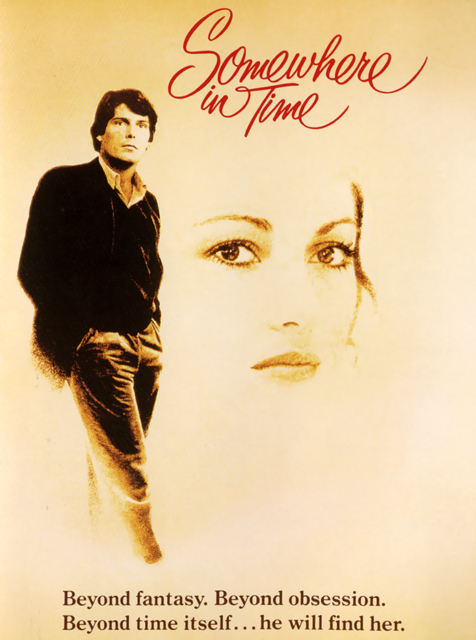 Before to be regarded in our days, alike a cult film, “Somewhere in Time” was a novel named “Bid Time Return” (1975) written by the great American author and screenwriter, Richard Matheson (“I am a legend” / 1954) ; « The Shrinking Man » / 1956) …). Despite the several and fine film adaptations of the Matheson’s novels, especially about his most famous : “I am legend” (“The Last Man on Earth” / 1964) ; “The Omega Man » / 1971) ; “I am Omega / 2007) ; “ I am Legend” / 2007), I think it is the best one and also a rare attempt to join two different cinematographic worlds : “Melodrama and Science Fiction”. 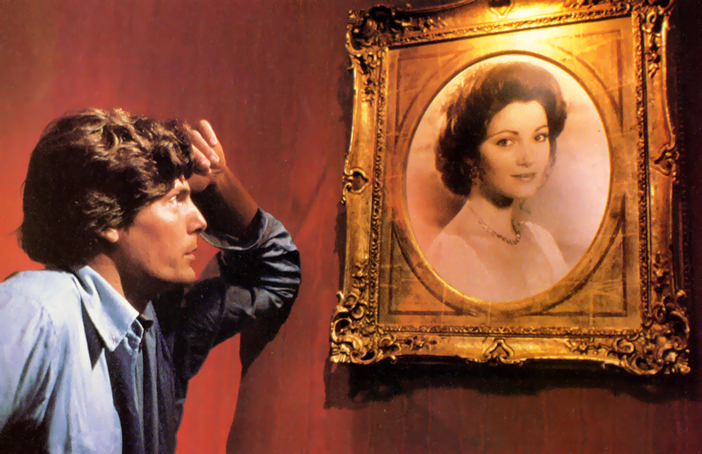 The Story : In 1980, Richard Collier (Christopher Reeve), a successful playwright, became enthralled, smitten by a photograph of a beautiful woman at the Grand Hotel’s museum in Michigan. He made researches and discovered that she was a famous early 20th century stage actress : “Elise McKenna” (Jane Seymour). But the most wonderful that he recognized her photograph as the elderly woman who gave him a pocket watch without telling his name during the celebration of his first play eight years before. In 1976, the producer Stephen (Deutsch) Simon (“What dreams may come” / 1998) bought the rights of the book for the screen. Two years later, he called the French origin director, Jeannot Szwarc (“Jaws II” / 1978) ; “Enigma” / 1983) as the director for the movie. After the agreement of Universal Studio to coproduce the movie with Rastar Productions for a low budget ($5 million), Matheson wrote the screenplay with the big challenge to use the Einsteinian concept of time (travel back in time) and showed it in attractive way to the public. The very talented actor Christopher Reeve (“Superman I” / 1978) ; “Monsignor” / 1982) ; “Deathtrap” / 1982)) took the leading role of Richard Collier. The acclaimed and gorgeous actress Jane Seymour (“Sinbad and the Eye of the Tiger » / 1975) ; “Lassiter » / 1984) portrayed Elise McKenna and the high class actor Christopher Plummer (“The Thorn Birds” (TV / 1983) ; “The Man would be King” / 1975) / see the topic…) portrayed William F. Robinson. Four distinguished actors complete this wonderful cast, the Academy Oscar winner, Teresa Wright (“The Best Years of Our Lives » / 1946) played with sensibility the part of Elise McKenna’s confident, Laura Roberts. The Grand Hotel's venerable bellman, Arthur Biehl was played with a lot of humor by Bill Erwin (“Dennis the Menace” / 1993). Susan French (“Topaz” / 1969) was the impressive old Elise McKenna and George Voskovec (“The Spy Who Came in from the Cold.” / 1965) portrayed with authenticity Dr. Gerard Finney, Richard collier’s college professor. The producers also gathered a fine technical team : “The American cinematographer Isidore Mankofsky (“The Jazz Singer » / 1980), the editor Jeff Gourson (“Tron” / 1982), the veteran Art director Seymour Klate (“The Manchurian Candidate” / 1962) ; “ Centennial (TV / 1979)) and the Emmy award winner costume designer Jean-Pierre Dorleac (“The Blue Lagoon” / 1980)”. In the summer of 1979 the movie was filmed on location at the Grand Hotel (Mackinac Island, Michigan) and Chicago,(Illinois) in Panavision, Technicolor. 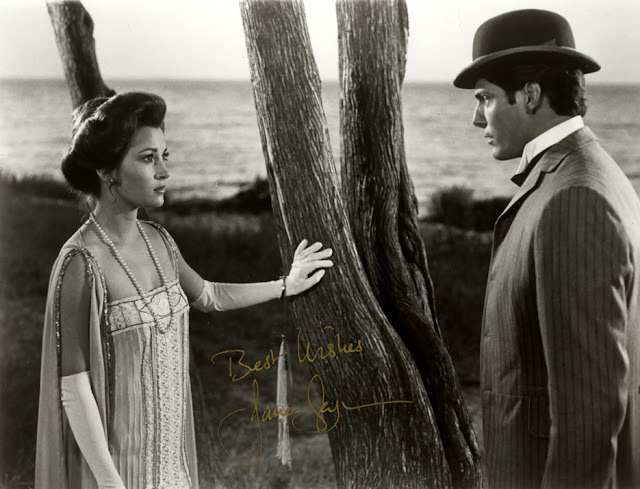 At the end of the shooting, Jane Seymour suggested to Szwarc to hire one of her friend and most successful composer, John Barry (“The last Valley” (1971 / see the topic) ; “Robin and Marian” (1976)). But the budget couldn’t afford him. Nevertheless, Seymour sent him the script. 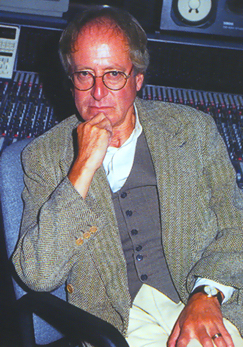 The British composer felt a great affinity for the story and accepted to write the score. The director first wanted to use the tenth symphony of Malher but soon realized that it wasn’t appropriate to the romantic mood of the picture. Then, Barry suggested to replace it by the eighteenth variation of Sergei Rachmaninoff's Rhapsody on a Theme of Paganini which began the recurrent melody in the film. But the whole score was composed by Barry. His love theme remains one of his best creation alike “Out of Africa” (1985) or “Born Free” (1966). “I think I‘ve had more letter about that score than any other score I’ve written… Why this music connected in that way, I don’t know… It had something to do with the time I wrote it, in that my father died, and within sixteen weeks of my father dying, my mother died, and this was the first music that I wrote after that period of time. I don’t usually get into the area of one’s direct personal life and what one is writing, but I don’t know, maybe that had something to do with shaping certain feeling in that Score”. For the first time in his career, Barry agreed to accept a percentage on the soundtrack sales as part of his fee. It was a clever decision because the soundtrack became one of the most popular score in the soundtrack history. The sales of the original album were so huge that in 1994, MCA released a digitally remastered, 24–Karat gold-plated compact disc album. Four years later, Varese Sarabande Label produced a new soundtrack album of the score conducted by John Debney with the Royal Scottish National Orchestra. In my opinion, this score is one of the most successful encounter between music and cinema. I regard it like a masterpiece. 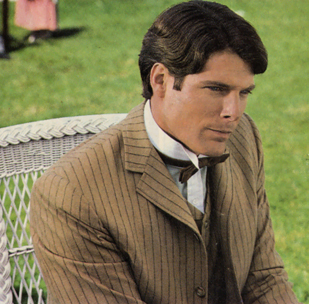 After “Superman I”, Christopher Reeve gave again a very elegant performance. He portrayed with a lot of authenticity and a great sense of humor the Richard Collier’s character. 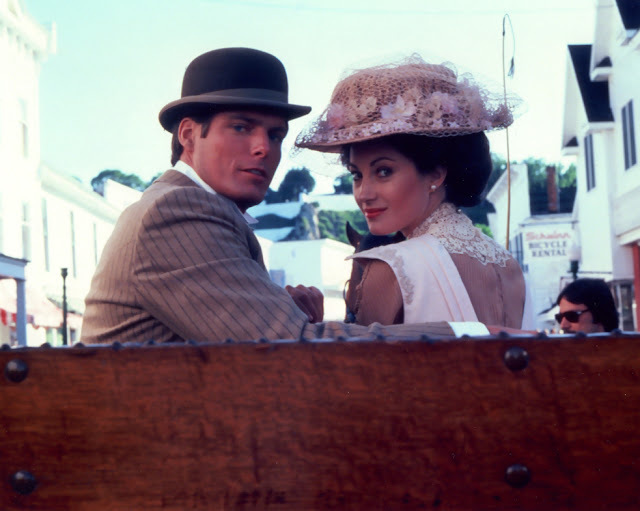 Jane Seymour gave also an outstanding performance especially in the scene when Elise reveals her love for Richard (“The man of my dreams”). The couple did very well on the screen and I deeply regret that they didn’t have the opportunity to make another movie together. Christopher Plummer, like always, gave a convincing performance. He was very impressed in the part of McKenna’s manager. Despite his hostility again Reeve’s character throughout the story, Plummer succeeded to feel us that he wasn’t a conventional villain. We understand his difficulties in face of Elise / Richard‘s romance which destroys the aim of his life (to make Elise the greatest actress of the period). Unfortunately, “Somewhere in time” didn’t become a “smash hit”. Although, it was well received during its previews (April 11th, 1980), Universal Studios first supported “The Blues Brothers” (John Landis) which came out the same week (October 3rd, 1980) with a large publicity campaign. Furthermore, an actors' strike did prevent Reeve and Seymour from promoting the film. Thus, they weren't allowed to publicize it and the critics' responses weren’t positives except in Europe and Asia. Then, “Somewhere in time” disappeared from the U. S. theatre screens in a few weeks later. But its reputation ground up and it became extremely popular all over the world (cable television and videocassette / DVD sales). The movie received several awards (Saturn Awards for Best Costume, Best Music, and Best Fantasy Film). 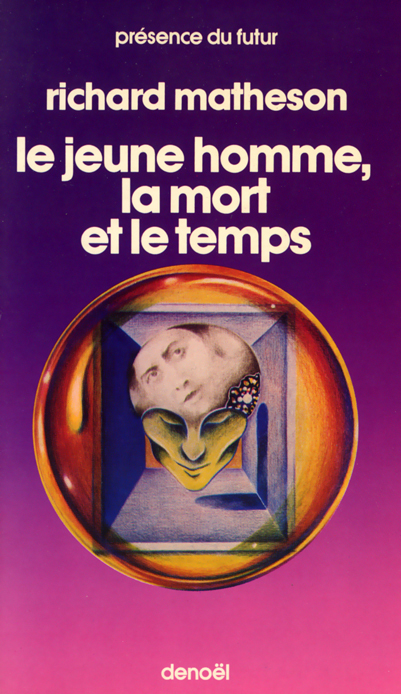 In France, it won the “Antenne d’Or” from the Avoriaz Festival and Jean-Pierre Dorleac received an Academy Award nomination for best Costume Design. Everytime, I see “Somewhere…”, I have a great feeling of sadness because I think about of the tragic last days of Christopher Reeve who remains to me a great “Superman” in the real life. “Bid Time Return” by Richard Matheson (in English) ; 1975 ; Viking Press, New York,USA. “Le jeune homme, la mort et le temps” by Richard Matheson (in French) ; Collection Présence du Futur, 1977 ; Edition Denoël, Paris, France. “The Somewhere in Time Story” by Bill Shepard “(In English) ; 2007 ; The Somewhere in Time Gallery (ISBN 0-9641698-0-0), USA. CD Album of “Somewhere in Time” by John Barry ; 1984 ; MCA Records DIDX 347 ; MCAD 5154. CD Album of the rerecording of “Somewhere in Time” by John Barry ; conducted by John Debney with the Royal Scottish National Orchestra ;1988 ; Varese Sarabande Label ; VSD 5911.